St. Petersburg is rightfully known as the Northern Venice. Numerous tributaries and channels, rivers and canals create an extensive network that resembles the circulatory system of a complex organism. St. Petersburg is one of the world’s leading cities in terms of the number of water routes. The territory on which the city was founded was cut by many rivers and streams. They flowed through forests and marshes and the water levels were much higher than they are today. The geography of the land changed during the process of development. Some 200 lakes and ponds, and more than 50 little rivers and channels were gradually redirected into pipes or filled in. At the same time, canals were built to dry out the marshes, allow for the passage of ships and supply water to other locations. For example, the Kronverksky canal was built around the Peter and Paul Fortress; the Kryukov Canal was dug between the Neva and Moyka rivers; Lebyazhy Canal was created to border the Summer Gardens; Obvodny Canal, the Winter Canal next to the Winter Palace and many others also appeared. It is impossible to count precisely all the rivers in the city. Some are filled in, while other canals are being dug. Channels are directed through pipes. Streams dry up. Some rivers are incorporated into the city, while others are declared outside the city limits. Everything literally flows and changes. 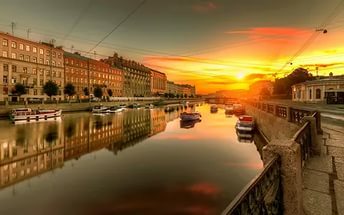 It is possible to say with some certainty that there are about 90 rivers, streams and channels in St. Petersburg, more than 20 large and small canals. The total length of these bodies of waters is about 300 kilometers, and they occupy approximately 7% of the total area of the northern capital. Rivers and canals have always played a key role in the city’s life. They were used to transport freight and passengers; they have been natural sources of water for fighting fires; they have protected the city from enemy invasion; and they are a constant source of drinking and domestic water. The rivers have dictated the city’s layout: the palaces, architectural ensembles and parks face the water, and many have their formal entrances on the waterfront. The city looks amazing when seen from the water: you can’t see the backyards, dead-end streets or unsightly courtyards of many European cities where the development was not planned but unfolded over many centuries. Here we see only elegant ensembles, buildings, bridges, embankments and sculpturesl This is particularly apparent during excursions along the city’s rivers and canals. Many firms offer such excursions from spring through autumn. St. Petersburg has always celebrated January 19, the Baptism of Christ, by blessing the waters. A hole would be cut in the Neva outside the Winter Palace and a wooden chapel erected over the hole. On that day the river would become another Jordan, the river in which Christ was baptized. The imperial family would descend to the «Jordan» using the formal palace stairs, which to this day is called the Jordan Staircase. A prayer service would be held and the water in the ice hole would be blessed. The celebration would conclude on the Neva with a parade of guards reviewed by the emperor himself. Petersburgers would prepare for the day in advance and schedule their children’s baptisms for January 19. Others would dive into the Jordan ice hole to cleanse themselves of the previous year’s sins. The same ritual was repeated in other rivers throughout the capital and the Russian land on that day. The Neva was a cradle of civilization in the area long before the city’s founding. Prince Alexander Nevsky defeated a powerful Swedish army in 1240 at the point where the Izhora River flows into the Neva. Perhaps it was at that distant time that the famous saying contained in the collection Heroism of the Russian People was coined. The collection, published during the blockade of 1941-1944, contains the words that, «No grass will grow on the River Neva; no enemy will take the Russian land.» As it happened, the city was founded below the confluence of the Izhora and Neva. But Peter the Great thought it so vital to connect the capital’s founding with the great victory that he decreed the battle to have taken place at the confluence of the Chernaya Rechka and the Neva, where he created a monastery in memory of the sainted Prince Alexander Nevsky. The Chernaya Rechka has been called the Monastery River ever since. The Fontanka is undoubtedly the city’s second most popular river. The river’s old name was Nameless Yerik, the name given to small channels that flowed from and to a river. The river became the Fontanka when pipes were run through it to feed the fountains of the Summer Garden. There was a landing dock on the Fontanka in the nineteenth century. Crossings were particularly numerous on exam days, since it was on the other shore of the Neva, in Peter’s Cabin, that the icon of the Savior — reportedly an aid in test-taking — was kept. Poor students and their concerned parents would flock to the miracle-working icon at such times. There are many legends about the Fontanka. These have resulted in sayings such as, «One can only argue with you at the Fontanka,» «When the ice on the Fontanka melts, in swims the smelt.» Everyone knows the children’s verses «Chizhik-Pyzhik, where have you been?» The response is: «On the Fontanka, drinking vodka.» A bronze statuette of a siskin bird occupies a small platform on the pier of the bridge linking the Fontanka and the Moyka, opposite the Summer Garden. The bird was not there long before it became an important feature of the city. The Moyka River marked the city limits in the mid-eighteenth century. The name is most likely a Russian version of the Finnish та. Some connect it with the Russian verb myt’, or bathe, since there were a number of public bathhouses on the Moyka. The rivers and canals were particularly useful in the winter. Boats and barges, landing-stages and floating docks would stay there for the season, frozen into the ice. Fishermen would catch fresh fish under the ice of the Gulf of Finland, freeze it, bring it quickly here on sleds and lower the fish into special baskets in which the fish would revive after their journey. The Neva’s ice could also be crossed during the winter. Special gangways were arranged for pedestrians and horses; the gangways would be sprinkled with sand for traction. There was even an electric tram that crossed the frozen Neva. Reindeer could also be used to cross the river; Samoyed drivers in reindeer skins would harness them to high sledges. The drivers’ tents stood right on the ice. Skating rinks illuminated by kerosene lamps and, later, electric lights would be organized on the rivers. Brass bands would play there on Sundays. Closer to spring, people would cut enormous blocks of ice from the river to use throughout the summer in ice cellars. The cut blocks would be stood on end and the ice would sparkle and glow in the spring sun. 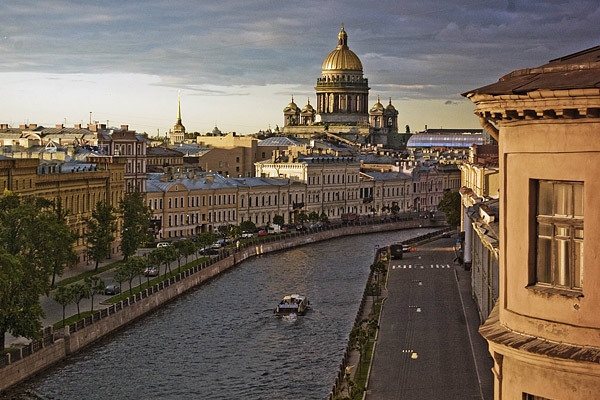 Life in St. Petersburg is closely connected with the city’s rivers and canals. When strolling along the embankments in the center of town you will be reminded of this by the granite landings and descents to the water, by the rings for mooring ships and the markers commemorating historic floods.